This is an opinion piece, a sort of alarmism-in-reverse, and no-one can be sure that any given weather or climate forecast will prove to be accurate or even on the right lines, but the arguments are here to consider. Numerous climate researchers do expect the solar slowdown to push average temperatures lower for at least a decade or two. Others think 0.04% carbon dioxide in the atmosphere will counter all that. The danger from the Global Warming crowd is that they are misleading the entire world and preventing us from what is dangerously unfolding that sparks the rapid decline in civilization – GLOBAL COOLING, says Martin Armstrong at Armstrong Economics. I previously warned that this is not my opinion, but simply our computer. If it were really conscious it would be running to store to buy heating pads. This year will be much colder for Europe than the last three. It will also be cold in the USA. We are in a global cooling period and all the data we have in our computer system warns that the earth is turning cold not warm. This cooling is very serious. This decline in the energy output of the sun will manifest in a commodity boom in agriculture as shortages send food prices higher. We will see famine begin to rise as crops fail and that will inspire disease and plagues. We will see the first peak in agricultural prices come probably around 2024 after the lows are established on this cycle. We have been warning that this rise would begin AFTER 2017. Previously, I have reported that NASA confirmed we are going into a cooling period – not warming. They have put out a forecast of declining sunspot activity. Now NASA has come out confirming what our computer has been forecasting. They have reported that as the sun is experiencing a rapid decline in sunspots, it is also dimming in brightness or energy output. NASA’s Spaceweather station has recorded during 2017, 96 days (27%) of observing the sun have been completely absent of sunspots. I have also previously warned that there is a 300-year cycle to this entire phenomenon. This cycle has aligned with the major turning point of the Economic Confidence Model2015.75. 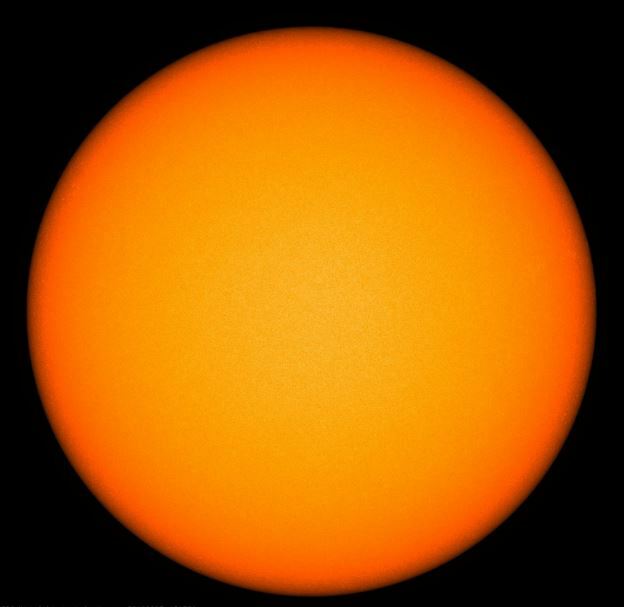 During 2015, there were ZERO days observed without sunspots. The following year, 2016, came in with 9% of the days recorded without any sunspot activity. This jump to 27% here in 2017 is a substantial jump from 2015 that we cannot afford to ignore. At least this prediction is in the near term, rather than decades afterwards. How much we cool may well be down to how much energy stored in the oceans during the Grand Solar Maximum is released on the years to come. Joe Bastardi certainly thinks that whilst we will cool out will only be to 70s levels, although a large volcanic eruption or eruptions, part of his triple crown of cooling, will be a wild card. Often wonder why main stream opinion ignores the global cooling thesis, which is soundly based on empirical observations. The warming thesis wilfully chooses to ignores that previous warming needed no help from CO2, so why should the one that recently seems to have expired. Rationality favours a bet on cooling. This author is basing his entire claim of imminent global cooling on a NASA press release from August 2013. Since then, we’ve passed the peak of Solar Cycle 24, the sunspot number has dropped to almost zero… and we’ve seen the four hottest years in recorded history. No global cooling is coming. Sorry. I remember farming hay and grain in the 1960s to mid 1980s. By the end of 1969 the glut of feed stuffs had reduced their price to $35-$45 per ton to the farmer. Barns and storage tanks were over full from years of over production and government financed storage programs. Crackpot handwaving at best, and a new 300 year solar cycle? Might be interesting to look up predictions of SC24 activity made before 2013. I read that the current low solar activity, especially the magnetic field, has allowed the Earth’s magnetic field to relax somewhat. This allows more ‘cosmic rays’ to impact the upper atmosphere with resultant increase in global cloud cover. Very effective cooling. Also earthquake activity is increasing. Of course a good volcanic eruption allows global cooling to offset CO2 overheating. Population reduction is the global governments agenda and frankly I agree with it, just not sure it will work in time as they make so many predictive errors. Re ‘a new 300 year solar cycle’: looks like some generous rounding going on there? So maybe 300 years since Maunder finished, but a cycle period comparison should use start dates. 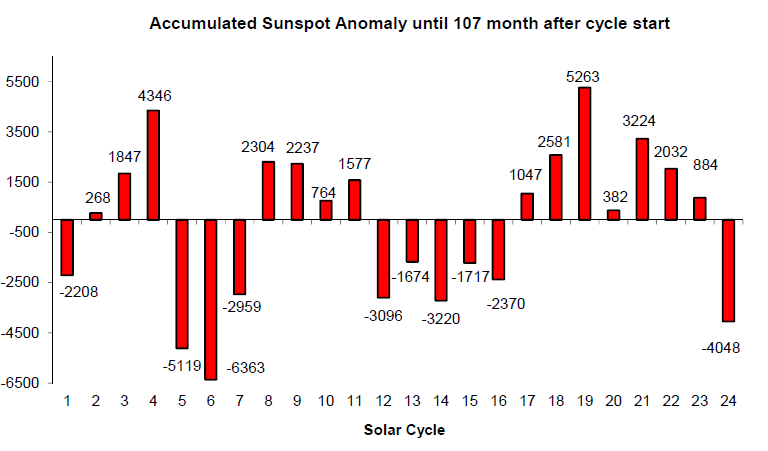 Also solar cycles 5 and 6 (early 1800’s – Dalton Minimum) had fewer sunspots at maximum than SC 24. Cooler periods and sustained low sunspot numbers do seem to correlate in the end though. Could we face a mini ice age in the next 30 years? Scientists make extraordinary prediction based on the sun’s natural cycles… and it would even reverse global warming! Global warming scientists continue struggling to find an explanation for the nearly 2 decades long global warming pause that has taken hold of the planet since the late 1990s. Oldbrew, your pictures show Niagara falls still spilling water. Back in 1970 I saw the falls frozen solid with no water flowing. I think it was in February. Later I also saw the canoe race across the St Lawrence in Quebec city when the river was completely covered by ice.. Very difficult for the competitors in the middle of the river as they could not paddle and the ice did not hold their weight. We spent the winter of 1969-1970 on the shore of Lake Ontario in an area called the “Banana belt” (because of the supposed mild climate). It snowed at the beginning of October when we arrived and the snow did not lift until a week before we left in mid May. Regarding sunspots, note that very small sunspots are numbered and counted along with large sunspots. Surely it must be the surface area of the sunspot which indicates the probable/possible magnetic flux disturbance. SC24 recorded quite a few very small lonely sunspots which might not have been visible during Maunder minimum. Any data on effect of sunspot size? Dark Days For German Solar Power, Country Saw Only 10 Hours Of Sun In All Of December! Some places only had 10 hours, but not everywhere. Still feeble though – solar is basically a seasonal power source, as well as daytime only. Plus it varies according to the weather conditions, and is very expensive per unit of power produced. Currently very low geomagnetic activity. The influence of low solar activity on the weather, in particular on the polar vortex, was not in the interest of scientists. Now it will change when solar activity decreases. Let them worry about another global warming after the next 60 years. The current temperature on the Gulf of Mexico. ren – what is the wave in the ‘wave amplitude’ graph? Read it and weep, climate alarm ‘experts’. Sow the wind, reap the whirlwind. Polar bear experts who falsely predicted that roughly 17,300 polar bears would be dead by now (given sea ice conditions since 2007) have realized their failure has not only kicked their own credibility to the curb, it has taken with it the reputations of their climate change colleagues. This has left many folks unhappy about the toppling of this important global warming icon but ironically, consensus polar bear experts and climate scientists (and their supporters) were the ones who set up the polar bear as a proxy for AGW in the first place. I published my professional criticisms on the failed predictions of the polar bear conservation community in a professional online scientific pre-print journal, which has now been downloaded almost 2,000 times (Crockford 2017; Crockford and Geist 2017). The east coast of the US was hit by a blanket of blizzards on Thursday, with even Florida seeing snow fall and 18 inches forecast for New England. The extreme weather is the result of what meteorologists have termed a “bomb cyclone” – a rapid drop in pressure, which has sucked in freezing weather from the north. Powerful winds – in some cases reaching 60 mph are threatening to make things worse, taking down power lines. By the end of this week, parts of the north east will be colder than Mars.